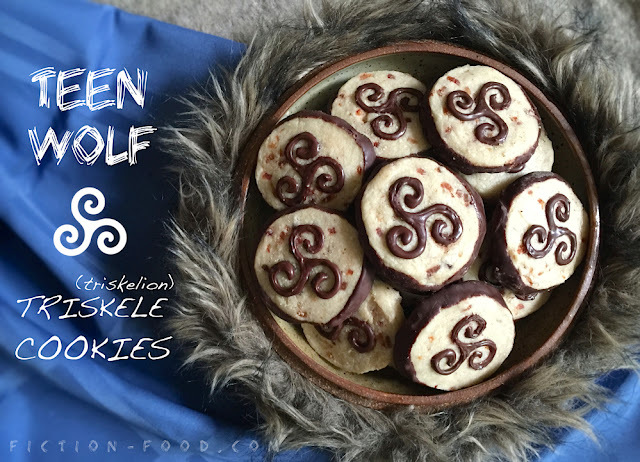 Fiction-Food Café: Triskele Cookies | MTV's "Teen Wolf"
Triskele Cookies | MTV's "Teen Wolf"
It's Moonday, y'all! 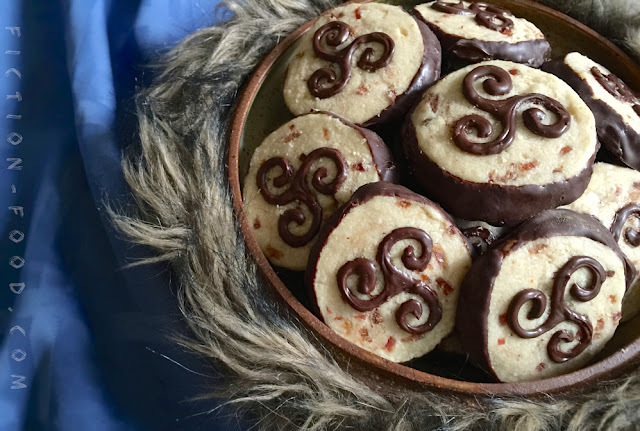 In celebration of MTV's "Teen Wolf" season 5 premiering tonight, I created these cookies inspired by the show! The triple spiral, a motif found in many ancient cultures, goes by the Greek name triskele or triskelion in the show and in imagery closely resembles the Celtic version. It is a reoccurring symbol in the show because of its connection to the Hale family of werewolves who use it to help their young ones focus their abilities. In the last episode of season four, Derek Hale tries to help the struggling, recently turned, high school freshman Liam regain control of his body on the night of a full moon. Derek: We have a mantra that we use. You repeat it and you focus on the words. It's like meditating. You say the words until you feel the control coming back to you. Liam: Okay, okay! What are the words?! Derek: Look at the triskelion. You see the symbol? I have a tattoo on my back it's the same thing. Each spiral means something. Liam: Can alphas become omegas? Derek: [Nods] All you have to do is say the three words. With each one you tell yourself you're getting calmer, more in control. Go ahead. Unfortunately, what worked for a young Derek Hale and his kin doesn't work for Liam. Instead, what does the trick, is a triple mantra from another werewolf clan, not connected to the triskele symbol–though for Liam I'm sure they come to mind together now–; "what three things cannot long be hidden? ", "the sun, the moon, and the truth". Other triskele meanings mentioned in the show are "past, present, future", and "mother, father, child" (s. 2, ep. 9). In the real world some of the meanings are the triple goddess "maiden, mother, crone" and the three lands "earth, sea, sky". It is a very beautiful symbol, whatever interpretation you take, as it ultimately symbolizes three aspects of one whole. And in "Teen Wolf", with the rise and fall and changing of many characters throughout the seasons, the image is very meaningful. Note: The cookies are made from a basic shortbread recipe from Ina Garten on Food Network. I added sugar-baked bacon because wolves, but if you're a vegetarian, please feel free to leave it out, no substitutions needed. 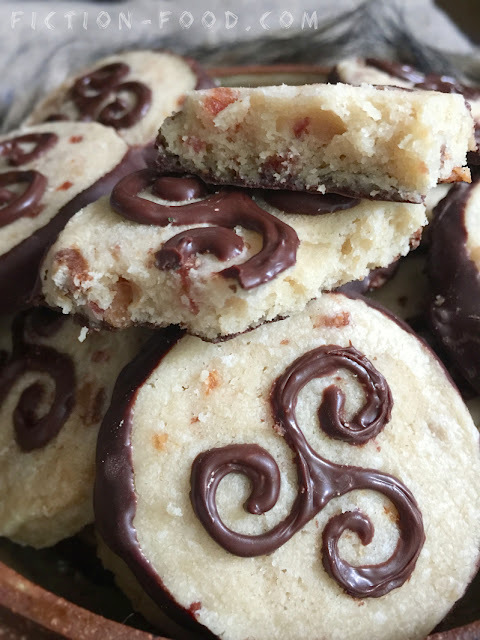 I also used dark chocolate because shortbread cookies are fabulous with it, but you can leave this off too if you'd like as chocolate is bad for those in the canidae family (though I'm pretty positive the issue was brought up on the show, but I can't find the reference!! If you know it please leave me a comment!). Instead of drawing the triskele symbol with chocolate, you can combine brown food color gel with a tiny bit of water and brush it on with a clean paintbrush. You can freehand it or still use a triskele cut out/stencil for guidance as described in the recipe below. 1. Heat your oven to 350ºF & line a baking tray (with sides) with aluminum foil & place a wire rack on top. Dredge the bacon strips in granulated sugar & lay on the rack. Bake for about 20-30 minutes & then let cool completely. Cut the bacon into tiny pieces (I used my kitchen scissors for this–made it really easy), about a 1/2 cup worth (eat any extra). Set aside until ready to use. 2. In a large mixing bowl beat the butter & powdered sugar until fluffy and fully combined, about 3 minutes. Add the vanilla & beat to combine. In a separate bowl, whisk together the flour, salt, & bacon pieces. Gradually add the bacon/flour mixture to the butter/sugar mixture on low speed. Beat until combined & then turn the dough out onto a large sheet of plastic wrap. Roll the dough into a log, about 2" diameter & chill in the fridge several hours or over night (if you have an empty paper towel tube, slice it open down the length & place the dough log inside. This will help the dough to keep its round shape on the bottom). 3. Heat your oven to about 340ºF and line a baking tray with parchment paper. Remove the dough log from the oven &, using a sharp knife, cut the log into 1/4" thick discs. Place the discs on the tray about 1" apart. If the dough has gotten very soft, place the tray of cookies in the fridge for about 10 minutes (this will help them keep their shape while baking. Bake the cookies on the middle rack for about 13-15 minutes or until slightly golden around the bottom edges. Transfer the cookies to a cooling rack by carefully picking up the sides of the parchment paper. Lay a new sheet of parchment on the tray & continue to bake cookies until the dough is gone, re-chilling the dough discs as needed prior to baking. 4. Melt the chocolate in a microwave-safe bowl in 30 second intervals, stirring until smooth, adding a little bit of optional EZ-Thin as needed. Lay a sheet of parchment on a tray or flat surface & place the cooled cookies & melted chocolate nearby. Working 1 at a time, place a cookie into the bowl of chocolate, bottom down, & use a fork to push chocolate onto the cookie's sides, & then to lift the cookie out of the chocolate. At this point I used my thumb & index finger to hold the cookie while I used the fork to scrape off the excess chocolate from the bottom, & then placed the cookie onto the parchment paper to harden. You can skip the holding it with our fingers part & simply place the dipped cookie onto the paper via the fork, but I just didn't want excess chocolate spreading out from under the cookie; no biggie though. 5. Print out a 1.5" triskele symbol (I simply dropped the image into a blank word document & resized it as needed). Cut around the symbol in a circle, 1/4"-1/2" white space on all sides, & then, using sharp, small scissors, carefully cut out the symbol itself so you end up with a little triskele stencil. Once the chocolate has hardened on all of the cookies, use this stencil & a food color marker to lightly draw a triskele on the center of each cookie. Remelt the remaining chocolate (adding more if needed) & pour it into a squeeze bottle or candy decorating bag cut with a small opening. Carefully trace the marker with the chocolate, using a clean toothpick for fine tuning in needed. Let the chocolate harden & you're all done! 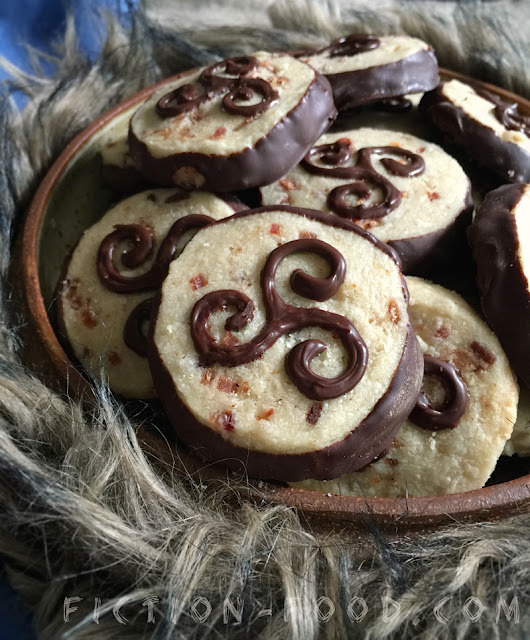 Serve these cookies with milk or a cup of tea, especially these "Teen Wolf" teas from Cara McGee and Meg Daunting!